The Pro Football Hall of Fame selectors shouldn’t have it both ways. They shouldn’t cite John Lynch’s lack of interceptions as a reason to keep him out of Canton when Ronde Barber can’t even get in the room for discussion as a finalist. Barber compiled some of the most unique statistics of any NFL cornerback, yet he hasn’t made the leap from semifinalist to finalist in each of the past two years. Barber’s time is coming, but Lynch’s time is now, or at least it should be. When 48 selectors sit down to vote late this afternoon, they are charged with a heavy responsibility. 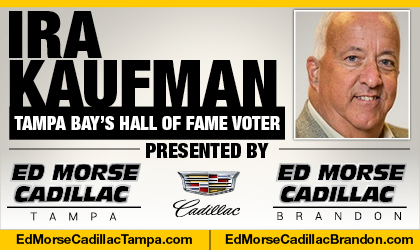 I’ve known that burden since 2005, when I replaced Tom McEwen as the Tampa Bay representative. You can make a strong case for all 15 modern-day finalists every year, but a maximum of only five can make it to Canton in any given class. Lynch is hoping the sixth time is the charm — and it should be. He has waited the longest and he enjoys broad support. He occupies a spot in two Rings of Honor and he occupied a spot in the mind of Barry Sanders, who doesn’t talk up many opponents. But when it comes to John Lynch, Sanders can’t say enough about the grit and intimidation No. 47 brought to the dominant defense of its time. And if the 1985 Bears can have three defensive players (Richard Dent, Dan Hampton, Mike Singletary) sporting gold jackets, why short-change the Bucs, who sustained their defensive run much longer than Buddy Ryan’s wrecking crew? Tony Dungy says Lynch had more responsibility in the Tampa 2 than any Buc player. He ran that group from the back end and when he arrived in Denver in 2004, Lynch reinvented himself. Different scheme, different teammates, different Lynch. All of a sudden, he was turned loose as a blitzer and Lynch responded with four sacks in 2005, tying for the team lead on a 13-3 club. He also registered four forced fumbles, becoming the first safety since Rod Woodson in 2002 to post those numbers in the same season. And when it comes to leadership, Lynch has few peers. He gained the trust and respect of his teammates the hard way … he earned it. When he wasn’t stopping Jerome Bettis cold, he was laying out Tony Gonzalez over the middle. The intimidation factor was real, even if it’s difficult to quantify. Lynch will know his fate by the end of business Saturday. If he receives a phone call, it means he fell short. But if Hall of Fame president David Baker knocks at Lynch’s hotel door, he’ll know he is joining Derrick Brooks and Warren Sapp in the immortal Tampa 3. Even if the news isn’t what he wants to hear, Lynch will likely be back in the room next year in Miami, vying for the Class of 2020. That will be Troy Polamalu’s first year of eligibility, the same Troy Polamalu who gave Lynch his Super Bowl helmet because he learned how to be an impact safety by watching Lynch play. 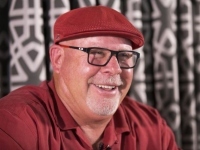 I asked Bruce Arians what it was like to prepare an offensive game plan, knowing Lynch was going to be on the other side of the ball. Arians said Lynch’s smarts and toughness made him stand out from his peers. You also had to deal with John Lynch, the man. Great article. Praying he gets in today! He deserves to be in the Hall. He was one of a few men who changed the way the game is played in his era. I attended almost every game from the time Sapp, Lynch and Brooks all arrived. I personally think Lynch deserves in over Brooks. Say what ya wil about Sapp the man, but he was the greatest player Ive ever seen go through the sombrero, and there were lots. Opponents included. I’m not dissing Brooks I think he belongs in too. Just think Lynch is more deserving. Unless you witnessed his impact first-hand its hard to put into words. I’m guessing thats one reason those other guys arent agreeing with you Ira. Lynch made more guys stop their routes than anyone would believe. So those simple incompletions on the stat sheets dont scream HOF. If intimidation was a stat Lynch would have been in first ballot. Very unassuming, humble man off the field too. Just how a HOFer should be drawn up. Good luck Lynch, even though you shouldnt need it. I love Lynch, but always thought it was strange that Denver selected him for their ring of fame (as it’s called) when he only played there for four years– and wasn’t even part of a SB winner, although that shouldn’t necessarily matter. I would think that they had several more deserving players in their history who contributed more. It makes me think that Denver, for some reason, factored in his success in Tampa in their selection, which is weird. To put it another way, I’m sure if Lynch began his career in Denver and left after four years (and with only four interceptions in those four years, as he had), pro bowl appearances or not, he would not be in Denver’s ring of fame. 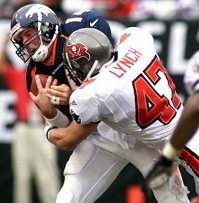 Back in the day … Sapp and Lynch were the two toughest guys on defense !! You should steal that one liner Ira…. HOF is more like the Hall of Shame when it comes to dissing Buccaneers. The Jason Taylor – 1st ballot business was more fishy smelling than our red tide plagued beaches this past summer…. Simeon Rice is more deserving than Jason Taylor was – and Sim can’t even get into the conversation…. And now they are stonewalling Ronde as well. For SHAME – Hall of Fame! Hope your hand picked substitute presenter for Lynch can talk some sense into these ‘boys’ Ira. Lynch has already waited too long. He is due! Good luck today John – you are obviously going to need it…. 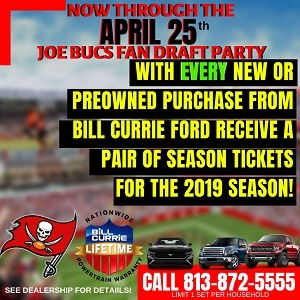 Its a shame that Ira is not presenting the more deserving and quite possibly the most beloved player in Buc History!!!!! Instead of trying to jam Lynch in, There should be protest until this man gets in!!!!! The Great Rhonde Barber!!!!!!!!!!!!!!!!! If it’s about game changing toughness and intimidation, and being an unstoppable force to be reckoned with, which I believe it should be, why do we never hear Mike Alstott in this conversation?? Go Lynch, met him once out in Denver, class act- humble, appreciative. Sapp- met him too, different story! He cursed me out down in Jupiter, FL because I asked for a photo with him. On one hand his statistics aren’t as good as guys like Dawkins who leapfrogged him last year. But stats for safeties are so misleading. Lynch spent so much time in the box he had to be accounted for pre snap more than most safeties. And we saw it….his “tackles” were not exactly equal to those of most other safeties. He is probably losing out from having multiple HOFers on that D as well. Not hearing a lot of support of him from all the talking heads, and Reed is a slam dunk so I am getting a bit discouraged. However, from looking at the guys who consistently got to the final 5, he seems like an overwhelming bet to eventually get in. I think next year is the year but I hope I am wrong and that Ira finally convinced the room this time. lynch’s best days were with the Broncos… not a hall of famer by any stretch but thanks to the clueless voters they have already rendered a once proud and worthy hall of fame a joke. I’m so proud that John was a Buccaneer. He brought his lunch pail to work everyday. A real gifted tough safety with an infectious personality that you felt totally confident would give 110% on every play. Monte Kiffin used to rave about John often after practices. He was the consummate pro who deserves a gold jacket now. Every reader nods head in agreement…..